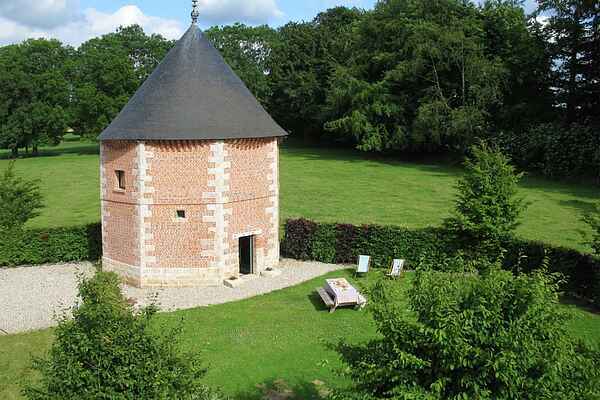 Between Dieppe and Rouen, a 25 minutes' drive from the beaches of Dieppe, you'll find this 18th century dovecote which has been completely renovated into a comfortable, spacious, bright house, surrounded by a garden and a fenced plot of a farm. In the middle of a rural area with fields and cows: a paradise for children! The house is tastefully furnished with new furniture and has a private entrance, enclosed private garden and a parking. All supplies to care for small children are available and outside there's a sandpit, slide and swing. The property is a unique location for families! On request, the owner can arrange (free of charge) a cot, bath, high chair, potty, games, et cetera for your children or babies. A few meters away is the owner's farm with animals like cows, goats, chickens and chicks. From the home, you can easily discover the region of Normandy. There are nice markets nearby in Buchy, Pavilly and Auffay. The beach is 35 kilometers away in Dieppe and Etretat (60 km). Note: the farmhouse is a real farm. During summer, there are ​​tractors driving around, but this does not cause any inconvenience to the guests.